The aircraft lifted off at a point of 1173 feet-1486 feet down runway 36 and was then seen to begin a steep climb at an angle of 20-45deg. to 300 feet-400 feet height. The plane then turned left and descended nose-down at a flightpath angle of about 45deg. until it struck the ground 1669 feet past the runway end and caught fire. PROBABLE CAUSE: "The failure and inability of the flightcrew to prevent rapid pitchup and stall by exerting sufficient push force on the control wheel. The pitchup was induced by the combination of a mistrimmed horizontal stabilizer and a center of gravity near the aircraft's aft limit. The mistrimmed condition resulted from discrepancies in the aircraft's trim system and the flightcrew's probable preoccupation with making a timely departure. Additionally a, malfunctioning stabilizer trim actuator detracted from the flightcrew's efforts to prevent the stall. 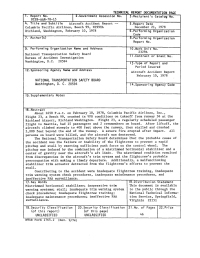 Contributing to the accident were inadequate flightcrew training, inadequate trim warning system check procedures, inadequate maintenance procedures, and ineffective FAA surveillance." Distance from Richland Airport, WA to Seattle/Tacoma International Airport, WA as the crow flies is 260 km (162 miles).